Blackmar-Diemer Gambit players sacrifice a pawn on e4 which is captured by a pawn. Black takes the pawn with a knight in the Huebsch Gambit with 3...Nxe4. IM Alfonso Almeida plays as Machinegun on the Internet Chess Club. 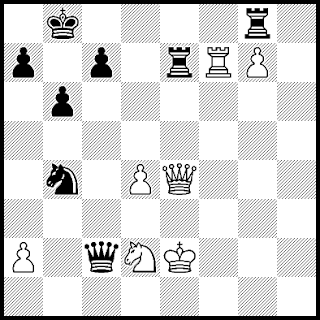 Here he chased the knight away with the unusual 4.f3. The main thing in a three-minute game is active tactics. The move f3 supported a kingside pawn assault with 7.g4, 8.h4, 15.hxg5, and 16.g6!